A daily journal for children aged 6 to 12, based on scientifically proven methods that promote happiness, develop healthy habits for life and nurture enquiring minds. Beautifully illustrated and easy to use, with just a few minutes focus each day, children benefit by being encouraged to express gratitude, reflect on their emotions and think about their actions. Top 3 things is all about gratitude. These little checklists will help you remember little moments and help you develop a growth mindset. You can get your family involved too. Try out these conversation topics at mealtimes with your family. Write your own quote or affirmation. We saw a marked difference in their behaviour and attitude and they both love filling it out every day. Keeping a gratitude journal is one of the most well-established happiness practices and the easiest to do. Practicing gratitude is central to the journal and a simple introduction to the concept encourages children to reflect on three positives of their day. Research has shown that practising gratitude through a journal increases a sense of happiness as well as a range of physical, psychological and social benefits including stronger immune systems, higher levels of positive emotions and being more helpful, generous and compassionate. Practicing gratitude not only helps children see the goodness in their lives but also that this can come from a number of sources. This is a term introduced by Prof Carol Dweck and a concept that many schools are now introducing as a way to support a positive learning mindset. Those with a growth mindset (as opposed to a fixed mindset) believe they can improve with hard work and perseverance and that their intelligence isn’t fixed. They display better self-esteem and increased resilience. 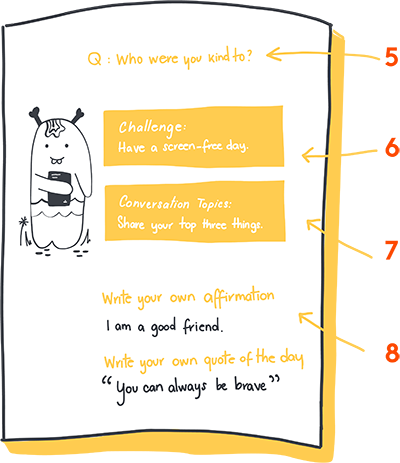 The journal encourages a growth mindset through checklist prompts and use of daily quotes to remind children about the importance of not giving up when faced with challenges. Studies with children show that behaviour leading to the enhanced welfare of others promotes increased physical and mental wellbeing. The journal encourages this in a number of simple ways through random acts of kindness, reflecting on who they were kind to (or who was kind to them) and prompts them to help others in a variety of different of ways. Mindfulness, or the ability to stay in the moment, has been linked through numerous studies to psychological and physical wellbeing. It can positively affect our brains, making the areas dealing with empathy, memory and emotional regulation more interconnected. The result is less stress, better sleep and more attentive behaviour amongst other things. The simple act of journaling is itself an exercise in mindfulness and the journal further encourages children to try meditation. 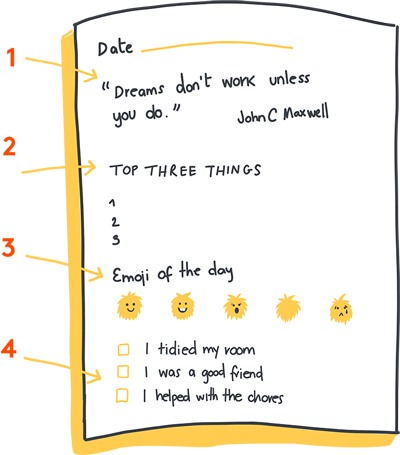 Time spent using the journal is an analogue antidote to screen time. Children are becoming increasingly distracted by social media and online games, activities that are proven to contribute to stress and other mental-health problems. The journal encourages family dialogue on this topic through numerous prompts for screen-free activities.